NOTE:This TR is from December 10, 2005. When conditions are right, the Tetons can provide good coverage by mid December and I have had many fun, steep, technical descents in the ‘cold smoke’ powder of the last month of the year. Reeders recently pointed out a line that has attracted his eye every time he rides out to ‘the vill’…we have dubbed it…The Pencil. It’s funny, turns out The Pencil is only, a pencil, in the early months of October and November. By the time we thought there was good enough coverage on the lower slopes to check-it-out and get a summit-to-valley descent, the pencil-like couloir had transformed into a rather wide, moderate angle slope…thought still incredibly fun…as always. We got an early start for December, skiing by 7AM, cuz it’s kind of a long haul into Open Canyon from the Granite Canyon trailhead. We were rewarded with a nice sunrise and a good view of our destination, the slopes lookers’ left of the Banana Couloir on the southeastern side of the mountain. After a bit of doubtful-route finding through thick forest growth, we found ourselves on-line and headed into the canyon. We soon arrived at the point where we would start to ascend the south-facing slopes and honestly…it looked grim. Thinly covered slopes that ‘whumped’ frequently when weighted. I turned up the volume on the I-pod and charged upward, hoping that deeper, more consolidated snow pack would be found. Sure enough, after a thousand feet or two, I found myself loving life, and just trying to find the best place to lay down the track. Often I will sacrifice the best or most efficient skinning line to keep the ski line fresh. I recommend this approach. We booted the last thousand feet and the summit rewarded us with high winds and cold December temps. We scurried down and around the north side a bit, hoping to get a glimpse of some of the northern shots down to Rimrock Lake. We had hoped to do a quick lap down to the lake before skiing the southeast side, back down into Open Canyon and racking up a nice 6000’+ day, but the winds beat us down to the core and we scurried back up to the top. A quick transition brought us to firm, cold, wind-scoured snow (surprise-surprise), but it was fun yet again. I got pelted in the face with every turn, my spray being thrown back at my by the wind. 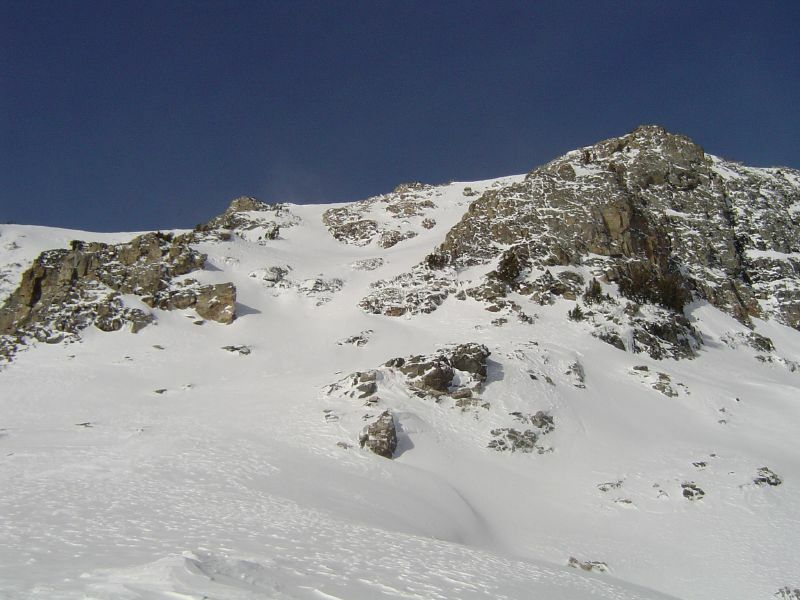 The lower 2000′ was great powder skiing, with ‘think-light’ turns, knowing rocks lured not to far below. The track was fast on the way back to the ride and I breathed the cold air in deep as the sun set behind the mountains. Great day to be a skier!